Isis Child is the brainchild of Freddy Mazzucco which he founded after working in the USA for several years. 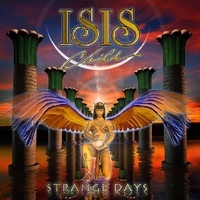 Back at the French riviera he put together Isis Child and in 2008 they released their first album called Ailleurs, now Isis Child is back with a new album and English lyrics, it's Strange Days. They kick of with Let's Take A Walk, a melodic rock tune with an 80's touch. The vocals of Nathalie Pellissier remind me a bit of Heart mixed with a dash of Alannah Myles... At Dancing they are heavier, mainly due to the heavy riffs. The vocals are more lascivious and build a nice contrast with the sharp riffs. For Can't You Hear Me Isis Child slows down for a semi-ballad. At this one Mme. Pellissier reminds me of Robin Beck, but it also has a singer-songwriter touch to it. With acoustic guitar they open I Love The Way, another tune which seems to melt together AOR and singer-songwriter stuff, but then heavy riffs call you back from reverie. The powerful rocker Loneliness is more the Robin Beck-style. If You Wanna Be Mine wins you over with it's singing guitar at the opening passage, but has more to offer for the listener! Looking For The One has a funky edge at the opening passage, but then becomes a powerful rocker. Even If is ennobled by great lead guitar play, but once again Mme. Pellissier is shining. The closer Stop Looking Down On Me offers more of this and even if the songs aren't overly catchy they will grow on you! And personally I prefer an album which grows on you, coz it usually means you won't grow tired of it too soon! I guess, I have to check out their French album... Fans of melodic rock with female vocals, fans of Heart, Robin Beck and Alannah Myles should give Strange Days a chance!